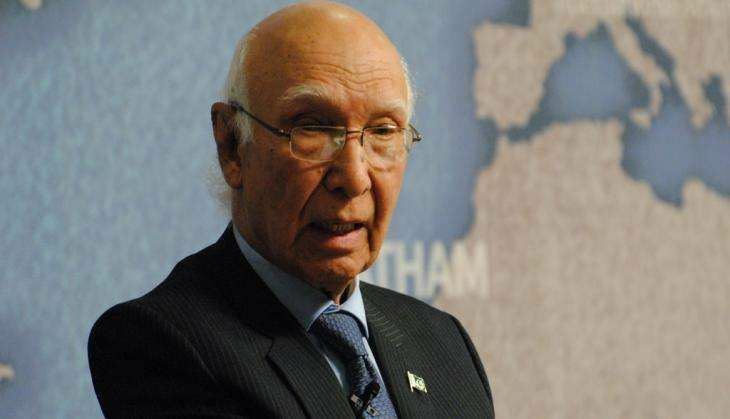 Advisor to Pakistan PM Nawaz Sharif on Foreign Affairs, Sartaj Aziz today discussed the Kashmir crisis with Foreign Ministers of Japan, Austria and Switzerland on the sidelines of 71st session of the United Nations General Assembly, in New York. "Acknowledging the sacrifices rendered by Pakistan in the campaign against terrorism, the three Foreign Ministers appreciated successful counter-terrorism operations conducted in tribal areas and the rest of the country. Sartaj Aziz noted that as a result of these operations, the security situation in the country has improved, which has enabled Pakistan's economy to grow at steady and sustainable rate. He welcomed investments from Japan, Austria and Switzerland in Pakistan," the Ministry of Foreign Affairs, Pakistan said in a statement. Aziz also briefed his counterparts on Pakistan-India relations and the situation in Jammu and Kashmir, highlighting the current state of violence in the Valley, as he stated that the settlement of Jammu and Kashmir dispute, in accordance with the United Nations Security Council resolutions, was essential for peace and stability of South Asia. Foreign Minister Fumio Kishida stated Japan attached high priority to its relations with Pakistan. He evinced keen interest in investment in Pakistan's power sector. Encouraging greater interaction of private sectors of the two countries, he welcomed the visit of Pakistan's business delegation to Japan. He also reiterated his invitation to Aziz to visit Japan. Foreign Minister (Federal Councillor) Didier Burkhalter of Switzerland mentioned that Swiss Development Cooperation is completing its fifty years of work in Pakistan. With improved security situation, the prospects of further expanding its work, according of Pakistan's priorities, were positive. He offered Swiss cooperation in Pakistan's water management sector. He appreciated Pakistan's role in hosting Afghan refugees for the last thirty years. Other issues discussed in these meetings were cooperation in multilateral organization, Pakistan's application for membership of Nuclear Suppliers Group, the situation in Afghanistan and ongoing conferences and themes of 71st United Nations General Assembly.